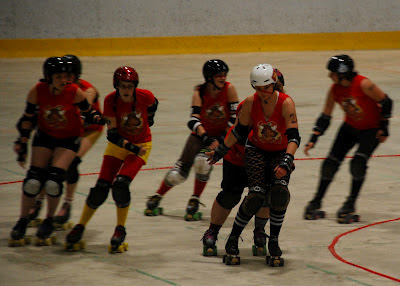 We have a friend here who skates in the local roller derby league, and I have to admit I'm intrigued. It sounds like a lot of fun, and the retro elements of the sport - costumes and four-wheel skates - really appeal to the vintage side of my style. On the other hand, I have never roller skated or roller bladed before, and only ice skated a couple of times in my childhood. The idea of learning how to do it at high speeds on a concrete track is more than a little bit daunting. And, they practice "in the middle of the night," because that's when they can get time in the sports centers otherwise dominated by off-season hockey practices. So, I resisted pulling yet another "Oh yes, I'll do that too!" Instead, I caught up with Stephanie, watched a derby match, asked a lot of questions, and even conned her into posing for a portrait sketching group that I participate in. Keep reading for pictures and a recently published QCT article. Living vicariously can be so much fun! 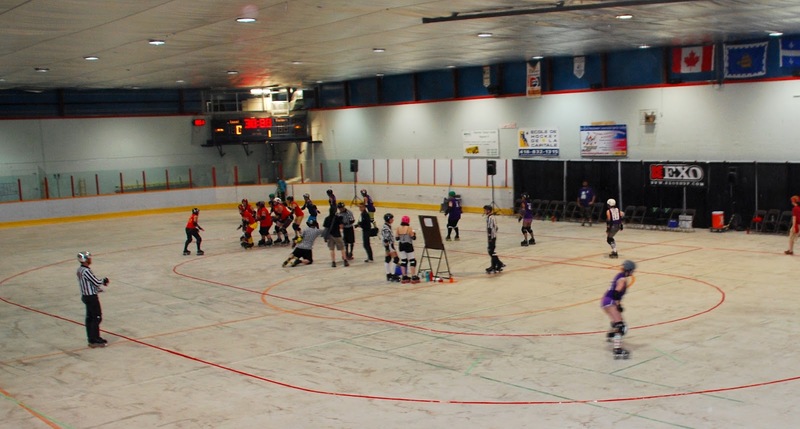 It is likely safe to say most of us have little to no experience with roller derby. 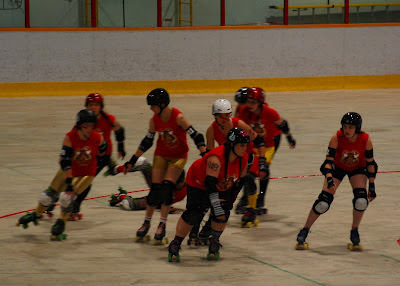 When you hear the words, perhaps you think of short shorts, roller skates, loud music, bright lights, and hockey-like aggression displayed by girls with far less protective gear - all signature aspects of a 1970s sport no longer en vogue. However, Stephanie Ewen recently assured the QCT that roller derby is experiencing a resurgence, and Quebec City is no exception. 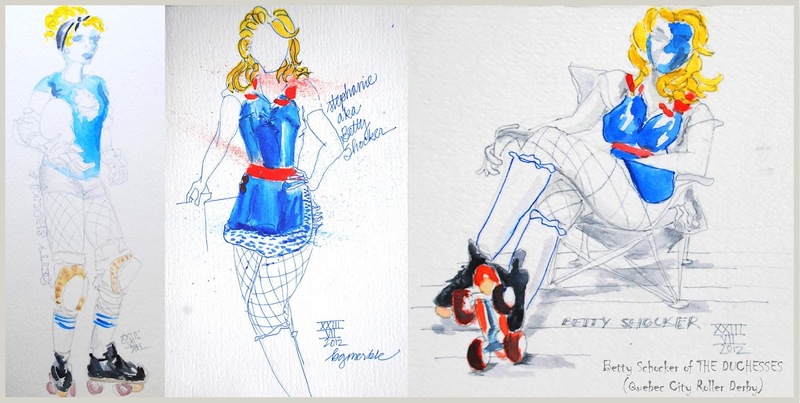 It began as roller skate races in the 1920s, and later evolved. 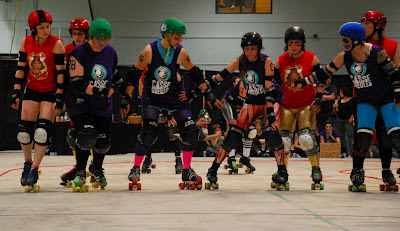 As Ewen explained, “Roller derby became a big televised theatrical event. It became so much of a spectacle that it was like pro wrestling. Limited to specialized tracks and increasingly predictable, it just died out.” Nearly four decades later, “it was revived in Texas, where the Women’s Flat Track Derby Association was established.” She added, “Roller derby is one of the fastest-growing women’s sports in the world.” According to WFTDA, there was one league in 2001, and today there are over 1,000 leagues. 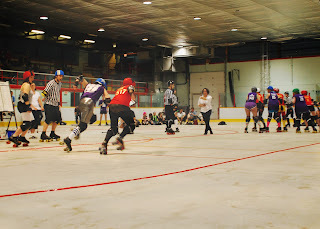 Ewen, in the white helmet, regularly plays as the ‘jammer,’ the player on each team able to score points by passing all five players on the other team.
. . . Click here to read full article (pg. 7) . . .
To learn more, or sign up, contact Roller Derby Québec by visiting http://rollerderbyqc.com or find them on Facebook. Loved the article. Have you taken it up? Thank you! I'm glad you enjoyed it. Lots of fun to write, for sure.